Beginning about 15 years ago, Florida enacted several new policies aimed at improving its public school system. Among these were the following: Schools were held accountable to higher standards; reading skills were emphasized, especially in the early grades; and public funding enabled more parents to choose such options as online courses, private schools, charter schools and neighboring public schools. Over the course of the following decade, Florida’s average student performance began to improve on the National Assessment of Educational Progress (generally considered the “nation’s report card”). In a 2012 study from Harvard University, Florida outperformed all other states but one, Maryland, on gains in how many students tested proficient on NAEP tests in reading, mathematics and science from 1992 to 2011. Florida achieved this unusual record while registering, by far, the nation’s lowest increase in per-pupil operating expenditures. The following report will look closely at the gains made by Florida students over the last decade and compare them to the performance of students in Michigan. 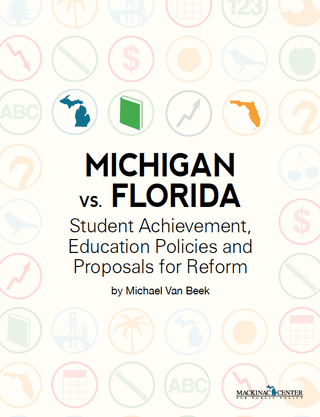 The report will also outline the Florida reforms that coincided with these achievement gains and use this analysis to weigh recommendations for Michigan’s public education system. Jay P. Greene, “An Evaluation of the Florida A-Plus Accountability and School Choice Program,” (Program on Education Policy and Governance at Harvard University, 2001), http://goo.gl/8gI5b (accessed May 31, 2013); “Just Read, Florida!,” (Florida Department of Education, 2005), http://goo.gl/JZgbT (accessed May 31, 2013); “School Choice Options,” (Florida Department of Education, 2012), http://goo.gl/lfjz2 (accessed May 31, 2013). “About the Nation’s Report Card,” (National Center for Education Statistics), http://goo.gl/qFIP1 (accessed May 31, 2013). Eric A. Hanushek, Paul E. Peterson, and Ludger Woessmann, “Achievement Growth: International and U.S. State Trends in Student Performance,” (Program on Education Policy and Governance; Harvard University and Education Next, 2012), http://goo.gl/tw5Wy (accessed March 21, 2013).